Attack of the Phoning Scrotums. E.T. can levitate. How then does he get left behind on Earth in the first place? D’oh! Used to be the greatest movie ever. When we were ten. From a story by Melissa Matheson, immortalized by director Steven Spielberg (back when he considered aliens benign and wonderful), E.T. THE EXTRA-TERRESTRIAL follows an extra-terrestrial alien named “E.T.” (puppeted by a brigade of effects techs) marooned on Earth, pursued by the American military, who finds sanctuary with a suburban family. He telepathically conveys his needs to the young boy of the family, Elliott (Henry Thomas), while doing silly things to pander to the kiddie demographic. Opening scenes show a quiet group of extra-terrestrials slowly fanning out from their spaceship parked in the night woods. Military arrive, looking like – ironically – the aliens from CLOSE ENCOUNTERS, every high beam and searchlight glowing ethereal red and blue. Aliens scatter for their ship – and again I ask: Why didn’t Our Hero E.T. simply FLY when chased by the humans? Elliott’s mom is Dee Wallace (who will be known throughout her career by the unfortunate epithet “Elliott’s Mom”); Elliott’s brother was one of those typical ’70’s kids (kinda Leif Garret, kinda Christopher Atkins) whose retro look is the new Now (kinda Jesse Eisenberg, kinda Michael Cera); Elliott’s sister is Gertie (7-year-old Drew Barrymore, in the best performance of her career, back when her lisp made her sound adorable and not a special needs case). Peter Coyote appears as a military guy just to jangle his keys. When Gertie dresses E.T. as a lady, Elliott asserts, “You should give him his dignity!” The filmmakers should heed their own advice. 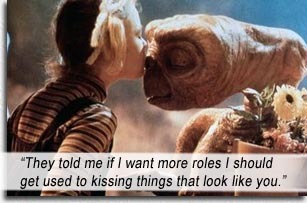 Though the scene is meant to endear E.T. to viewers, he is not some trained chimp or cute baby – he is an interstellar traveler, a botanist apparently, and, we presume, one of the smarter adults of his species, for him to be an astronaut. On this alien world – Earth – we would expect him to naturally approach everything with trepidation, but he is infantilized by the filmmakers and portrayed as having the wits of a Sarah Palin. And he never seems to understand the concept of keeping a low profile until Elliott’s Mom actually looks for him in the closet. Dee Wallace’s directorial advice seems to be “act mildly retarded.” In fact, all the grownups are in the same short bus. It says something terrifyingly vapid about your soul when you are out-acted by a puppet. The movie is supposedly told from E.T.’s point of view, but that is incorrect – the movie is told from a KID’S point of view: only kids will identify with the seeming blindness and callousness of the adults who never seem to notice them, thusly, not “seeing” E.T. either; kids will connect with the Us-versus-Them nature of having a secret and keeping it from the adults; kids will laugh at E.T. trick-or-treating dressed as a ghost and will thrill at Elliott riding around the countryside by himself after his bedtime with his scrotum-creature in his basket; to keep it understandable, government cars are clearly marked “United States Government,” bad guys are faceless and mute, and magic kicks in whenever we need a deus ex machina. Keeping it simple for kids, E.T.’s spaceship looks like a flying saucer with a ramp down to the ground – in complete opposition to his species’ physical design. You see, if this were E.T.’s point of view, there wouldn’t be a ramp. Why would a species that has the ability to levitate have a ramp? Especially when they find it so difficult to waddle up the ramp, with those six human puppeteers all pulling in the wrong directions? As he did with CLOSE ENCOUNTERS, Spielberg uses lighting creatively to heighten mystery and suspense, and once again employs composer John Williams, whose lyrical and epic score lifts this kiddie movie to something beyond the stars. Apparently, that “E.T. phone home” catch phrase worked like a charm, as his spaceship returns to pick him up in a tear-jerking ending that sees him flying off never to return in a sequel (but in so much merchandise it would make Gene Simmons’s marketing gland swell). With a vocabulary of about twenty human words under his belt, any more time on Earth, and Sarah Palin might have backed him for congress. aka: ET THE EXTRA TERRESTRIAL, E.T. : THE EXTRA-TERRESTRIAL. Starring: Henry Thomas, Drew Barrymore, Dee Wallace, Peter Coyote, Robert MacNaughton, K.C. Martel, Sean Frye, Erika Eleniak.